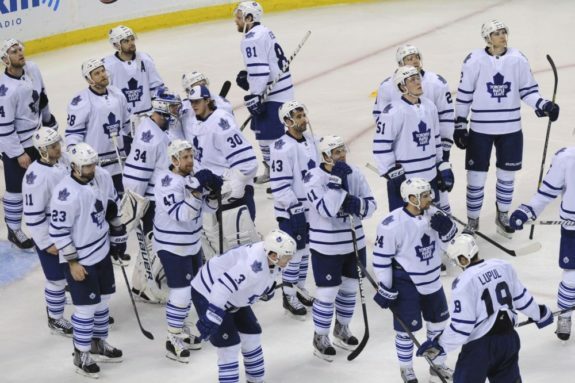 The Toronto Maple Leafs, like many teams, are a team with many fantasy wildcards. Is this the year Jake Gardiner becomes the point producing defenseman he was advertised to be in his rookie year? Or will rookie Morgan Rielly rise up and turn heads fantasy wise? What about Cody Franson? Up front it doesn’t get any easier. Sure, you have Phil Kessel who is a bonafide fantasy stud, but what about his potential linemates Joffrey Lupul and James Van Riemsdyk. One is a LTIR all-star, the other, a frustrating power-forward who is hesitant at times to drive the net. Needless to say, there is much risk if you choose to dabble into the Toronto Maple Leafs pool to fill out your fantasy roster lineup. For those who are brave, here are my top five picks for fantasy locks on the Leafs. Are you remotely surprised? Phil Kessel is quietly putting himself in the conversation with Patrick Kane as one of the top right wingers in the NHL. The big surprise is that he has yet to surpass the 40 goal mark. Is this the year? Quite possibly. Kessel is not only an extremely gifted player, but he is entering a contract year. Don’t be shocked if Kessel is talked about less for stick swinging, and more for Rocket Richard contention by the end of the 2013-2014 season. While not the goalscorer he was as a young gun with the Calgary Flames, Dion Phaneuf is a very strong two-way defenseman who should be considered among the top 20 at his position in the league. He too is motivated by the money-bug as he chases a new contract for next season. expect the best out of the Leaf’s captain this season. The only question was where this effective, but injury-prone winger would slide onto the list. Lupul managed to score at an above point-per-game pace for the second straight season last year. Unfortunately, neither of those seasons were full ones. If, and that is a big if, Lupul can stay healthy, the sky is the limit for this player. He could be the highest scoring player on this team in 2013-2014, but his fantasy projection carries a ton of risk. Blessed with a nearly unlimited supply of offensive creativity and confidence, there is no telling how many points Kadri could have put up last season playing full-time with Phil Kessel. But, the young forward spent quite a but of time last year toiling with tweeners, punchers, and grinders. This may have lowered his quality of competition, but there is no doubt that Phil Kessel, Joffrey Lupul, or James Van Riemsdyk could have finished some of the tap-ins Kadri let slip by feeding the likes of Leo Komarov, Colton Orr, and a struggling Clarke MacArthur. This year he will have the line mates, let’s see if he can keep up with the stronger pressure put up against him. Something of a gentle-giant reclamation project, James Van Riemsdyk played his first season with the Leafs last year following a high-profile trade for rugged defenseman Luke Schenn. All the promising he seemingly gave up in Philadelphia seemed to reappear in Toronto as JVR burst out of the gate last season only to tail off. Thus far in the preseason we have seen JVR getting to the net, playing the game his way, and looking dominant with some procrastinators proclaiming that this the year that this former second overall pick makes due on the promise he showed as a teenager. if that happens, he won’t be just appearing on top lists for Leafs players, but showing up as the steal of your fantasy draft. Cody Franson could be the most valuable defenseman for the Leafs fantasy-wise. What is holding him back isn’t his play or any sort of drawback hockey-wise, Franson just has yet to report to Leafs training camp. He has just signed, but will the lack of a training camp have an effect? If he gets back with the program quickly he should be worth that gamble in the later rounds of your fantasy draft as he possesses a very accurate bomb from the point and has shown offensive creativity that is nearly unmatched on the Leaf’s blueline. I know, a really impressive stat-line for last season, haha. Gardiner burst onto the scene for the Leafs in 2011-2012, appearing in 75 games and picking up 30 points. He was afflicted by a very serious concussion last year that limited him in both the AHL and NHL. He came back, looked dismal, and toiled in the minors until a late season call-up made good on the #FreeJakeGardiner hashtag. While the regular season was a lot of the same for the sophomore, Gardiner turned it on in the playoffs, scoring once, and assisting on four goals over the course of six playoff games for the Buds. Tread very carefully, this riverboat gambler plays fast and loose at both ends, wowing you with raw skills one minute, and racing for the bathroom the next. All things considered, Gardiner is someone you need to keep your eyes on as the fantasy season progresses and we find out which Jake Gardiner is showing up in 2013-2014. Was there any other choice? Morgan Rielly at this time stands to make the Toronto Maple Leafs opening day roster for the 2013-2014 season. While the flash is there in his skating, passing, and intelligence, Rielly doesn’t have a heavy shot, limiting his effectiveness on the powerplay. With that being said, if Rielly can use his ability to join the rush, make smart passes, and play smart in the offensive zone, there is no reason why this 19-year old stud can’t find himself near the top of the list for rookie defensive scoring. That is, if he lasts more than nine games.